each component of the system for an opportunity to reduce electrical losses. A qualified individual should oversee the electrical system since poor power distribution within a facility is a common cause of energy losses. Opportunities to improve drive system efficiency. Where Appropriate. 9. Consider Load Shedding. 10. Choose Replacement Before a Motor Fails. Items to help facility management staff identify opportunities to improve drive system efficiency. 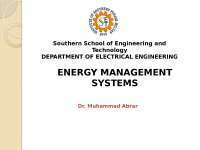 Electrical Systems. 15. Minimize Rewind Losses. 16. Optimize Transmission Efficiency. 17. Perform Periodic Checks. 18. Control Temperatures. 19. Lubricate Correctly. 20. Maintain Motor Records. selection, installation, operation, and maintenance of an electrical motor driven system. Motors designed for rated voltage, frequency, and number of phases. 10 percent deviation factor. Operation within a tolerance of 5 percent of rated frequency. Operation within a voltage unbalance of 1 percent or less. severe, the torque might not be adequate for the application. speed with unbalanced voltages will be greatly unbalanced in the order of 6 to 10 times the voltage unbalance. convert electrical energy into mechanical energy. GLOSSARY OF FREQUENTLY OCCURRING MOTOR TERMS Efficiency Efficiency= EFF = 746 × HP Output/Watts Input Frequency This is the frequency for which the motor is designed. Full Load Speed An indication of the approximate speed that the motor will run when it is putting out full rated output torque or horsepower is called full load speed. Constant Torque Constant torque is a term used to define a load characteristic where the amount of torque required to drive the machine is constant regardless of the speed at which it is driven. For example, the torque requirement of most conveyors is constant. Variable Torque Variable torque is found in loads having characteristics requiring low torque at low speeds and increasing n values of torque required as the speed is increased. Typically examples of variable torque loads are centrifugal fans and centrifugal pumps. Service Factor The service factor is a multiplier that indicates the amount of overload a motor can be expected to handle. For example, a motor with a 1.0 service factor cannot be expected to handle more than its nameplate horsepower on a continuous basis. Similarly, a motor with a 1.15 service factor can be expected to safely handle intermittent loads amounting to 15% beyond its nameplate horsepower. Slip Slip is used in two forms. One is the slip RPM which is the difference between the synchronous speed and the full load speed. When this slip RPM is expressed as a percentage of the synchronous speed, then it is called percent slip or just ‘slip.’ Most standard motors run with a full load slip of 2% to 5%. Synchronous Speed This is the speed at which the magnetic field within the motor is rotating. It is also approximately the speed that the motor will run under no load condition. For example, a 4 pole motor running in 60 cycles would have a magnetic field speed of 1800 RPM. The no load speed of that motor shaft would be very close to 1800, probably 1798 or 1799 RPM. The full load speed of the same motor might be 1745 RPM. The difference between the synchronous speed of the full load speed is called the slip RPM of the motor. Temperature Ambient Temperature. Ambient temperature is the maximum safe room temperature surrounding the motor if it is going to be operated continuously at full load. In most cases, the standardized ambient temperature rating is 40°C (104°F). This is a very warm room. Certain types of applications such as on board ships and in boiler rooms, may require motors with a higher ambient temperature capability such as 50°C or 60°C. Temperature Rise. Temperature rise is the amount of temperature change that can be expected within the winding of the motor from non- operating (cool condition) to its temperature at full load continuous operating condition. Temperature rise is normally expressed in degrees centigrade. Torque is the twisting force exerted by the shaft or a motor. Full Load Torque Full load torque is the rated continuous torque that the motor can support without overheating within its time rating. Peak Torque Many types of loads such as reciprocating compressors have cycling torque where the amount of torque required varies depending on the position of the machine. The actual maximum torque requirement at any point is called the peak torque requirement. Peak torque are involved in things such as punch presses and other types of loads where an oscillating torque requirement occurs. Pull Out Torque Also known as breakdown torque, this is the maximum amount of torque that is available from the motor shaft when the motor is operating at full voltage and is running at full speed. The load is then increased until the maximum point is reached. Pull Up Torque The lowest point on the torque speed curve for a motor accelerating a load up to full speed is called pull up torque. Some motors are designed to not have a value of pull up torque because the lowest point may occur at the locked rotor point. In this case, pull up torque is the same as locked rotor torque. Starting Torque The amount of torque the motor produces when it is energized at full voltage and with the shaft locked in place is called starting torque. This value is also frequently expressed as ‘Locked rotor torque.’ It is the amount of torque available when power is applied to break the load away and start accelerating it up to speed. Power factor may be “leading” or “lagging” depending on the direction of VAR flow. Cause of Low POWER FACTOR (pf)? non-power factor corrected fluorescent and high intensity discharge lighting fixture ballasts (40%- 80% pf)  arc welders (50%-70% pf) solenoids (20%-50% pf) induction heating equipment (60%-90% pf)  lifting magnets (20%-50% pf)  small “dry-pack” transformers (30%-95% pf  induction motors (55%-90%pf) Induction motors are generally the principal cause of low power factor because there are so many in use, and they are usually not fully loaded. The correction of the condition of LOW power factor is a problem of vital economic importance in the generation, distribution and utilization of a-c power.